We really need rain at the moment and, if it must rain, today was the best sort of rainy day for toddlers. It was wet overnight and in the morning, but temperatures remained mild and the skies brightened in the afternoon. 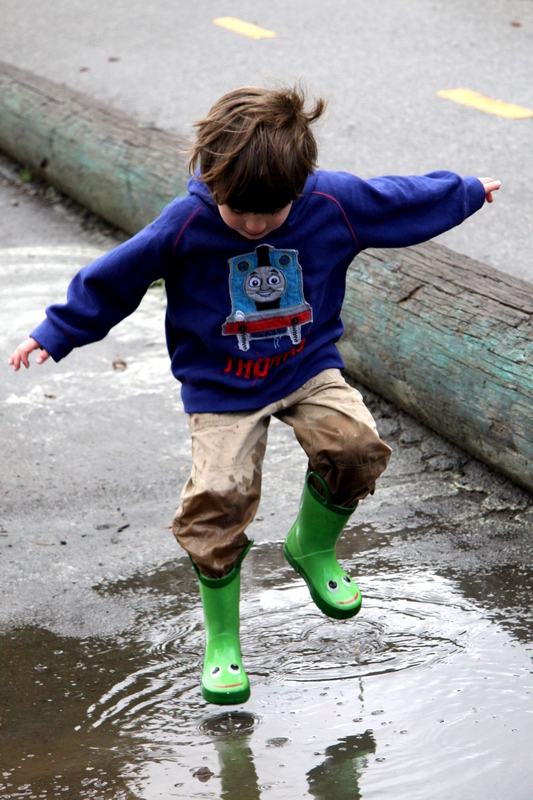 This meant it was perfect weather for puddles which, for toddlers, is what rainy days are all about. 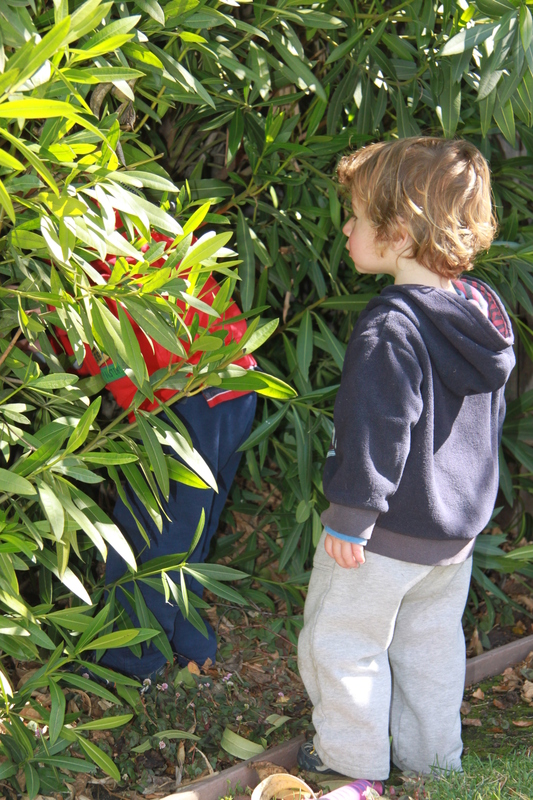 I really don’t like taking the boys to indoors play areas at any time–they just have too much energy for those places–but I really hate taking them to indoors play spaces on wet winter days when they are crowded with frustrated and often sickly kids. It always ends in tantrums or fevers. Plus, the boys love the wet. So now when it rains I just take the kids outside. What is it the Scandinavians say? There’s no such thing as bad weather, just bad clothes? Sometimes we do a Serious Wet Weather Hike on the weekends. Stevens Creek is one of our favorite and super muddy destinations as the rain really brings the wildlife out. Hidden Villa also has awesome puddles after a storm. Other times we just do a rain walk down the street which is what we did today. 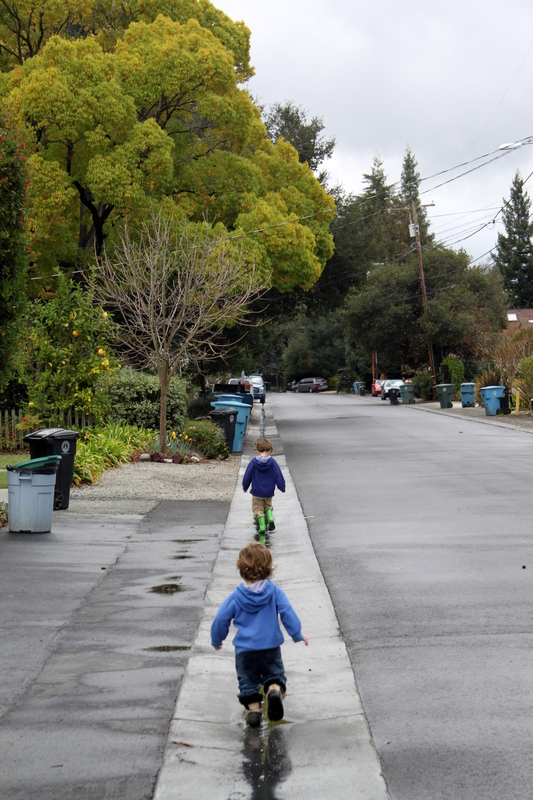 It’s a little disappointing that the City of Palo Alto put storm drains in our road last year as this has had a deleterious effect on our street’s puddles, but the little ones had fun following the run-off down the street and working out where it fed into the creek. And the local park still had puddles galore. In the end, we spent just about the whole day outside as usual. When do boys grow out of this? 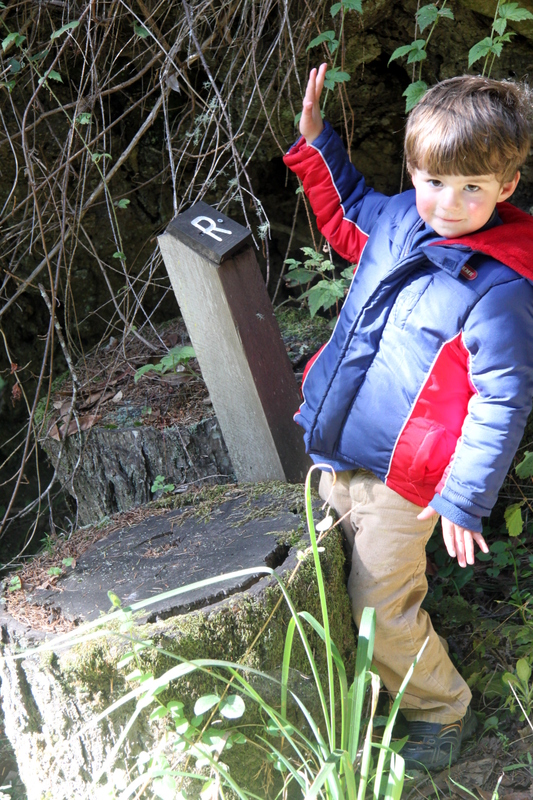 Where do you like to take your kids to enjoy some outdoors rain time? I’m always looking for inspiration on this one. And the more puddles the better. [as a side note, I often find the weather forecasts exaggerate the chance of rain round here and I’ve come to relay on this radar program to let me know what storms are actually in the area. It’s pretty good at forecasting the following 6 hours – perfect for planning toddler outings]. I was fascinated by a recent report that suggested sugar is about as toxic to our bodies as alcohol and that we eat far, far too much of it. You can find a good summary of the report here (the actual report is behind a subscription wall). Now I know this has been a little controversial but its basic arguments, that too much sugar is unhealthy and that sugar is addictive, do seem to be substantiated by the evidence. I also know that I am a terrible sugar addict with out-of-control cravings for mint aeros and jam. Inspired by the report (and by the hope that a sugarless diet will shift that last bit of second-baby-fat), my husband and I have decided to do a ‘no sugar month challenge’ and March is the month. As of tomorrow, we are both going to try to exclude any items with added sugar from our diets. (Foods with naturally occurring sugars – fruits–are permissible). He feels he can do it. We both feel I will last about three days. We shall see. Declaring the challenge to the world is my way of seeking accountability in the hope I may make it to five days. And what a good example we would set our kids right? Although it seems early, this week we started thinking about our summer veggie garden. I’m told by my green-fingered neighbour that now is the time to plant seeds so that the baby plants will be ready to transplant in a month or two. Sowing seeds directly into the soil round here just doesn’t work–far too many slugs. You can wait a couple of months and plant shop-bought seedlings into your beds, but I thought it would be fun for the boys to grow our plants from seed this year. Our winter veggie garden was only a moderate success. We did get some broccoli, cauliflower and cabbage out of it, but the weather was just too warm and the frosts too few for these plants to flourish. I have higher hopes for our summer garden. So this week I took the boys off to our favourite local nursery to get some seeds. 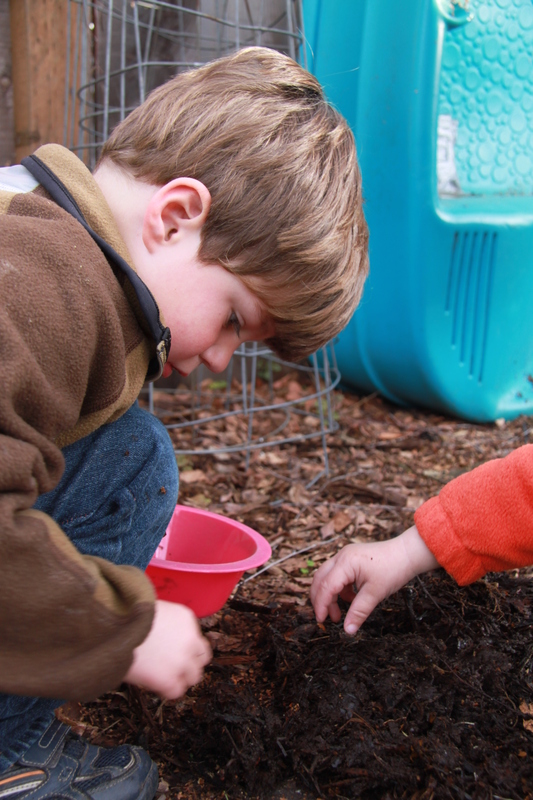 They then had heaps of fun planting the seeds in a mixture of potting soil and home-made compost. The compost worms were a big hit with both kids, although extracting one from The Puppy Dog’s mouth was not my favourite mothering moment. That child has a deep attraction to all things slimy and gross. The Monkey seemed to get the idea of what we were doing and enjoyed it, even if The Puppy Dog kept wondering round the garden planting seeds everywhere. Who knows what we will find growing where. In the end we planted sunflower, snap pea, snow pea and cherry tomato seeds and are watching for them to germinate. We also bought some pumpkin seeds as I want to grow our Hallowe’en pumpkins this year, but they can wait a month or two for planting. A certain element of surprise has been added to the process by The Monkey who, when my back was turned, pulled all the labels out of the planters declaring “we know what we planted Mommy! We don’t need them!” So we’ll have to try to identify the plants as they grow. We may yet end up with a Mammoth Russian Sunflower teepee rather than a snow pea one. We’ll see. Latest scientific research concludes video games (even including the wii) do not make children more active or improve their fitness. Maybe instead of trying to make more active/interactive video games we should just put the consoles away and go outside if we want to get our kids active and keep them healthy? 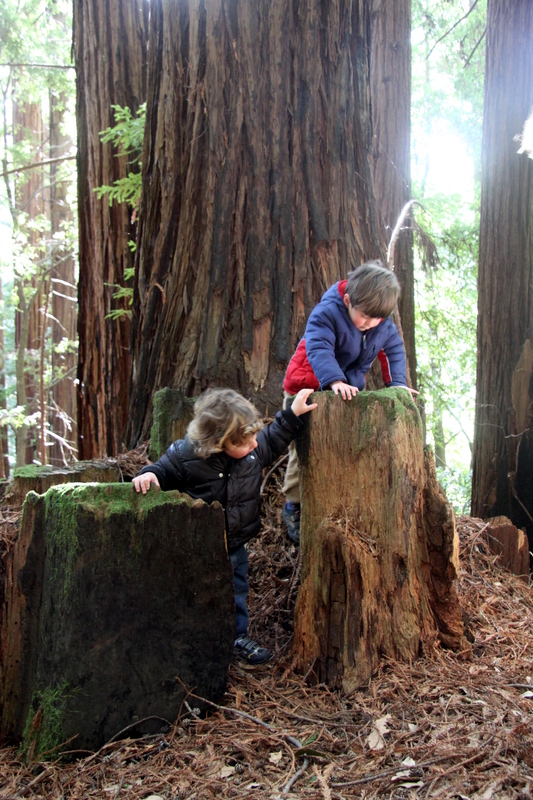 This weekend we headed up to Memorial Park to check out the old growth redwood forest. As usual, we were the only family on the trails (although one hardy family with older children was actually camping out there for the weekend-kuodos to them!). We fairly flew along the path as it had two key attractions for our children: The Monkey was fascinated to discover the alphabet amongst the trees and the Puppy Dog was delighted by the banana slugs all over the trail. 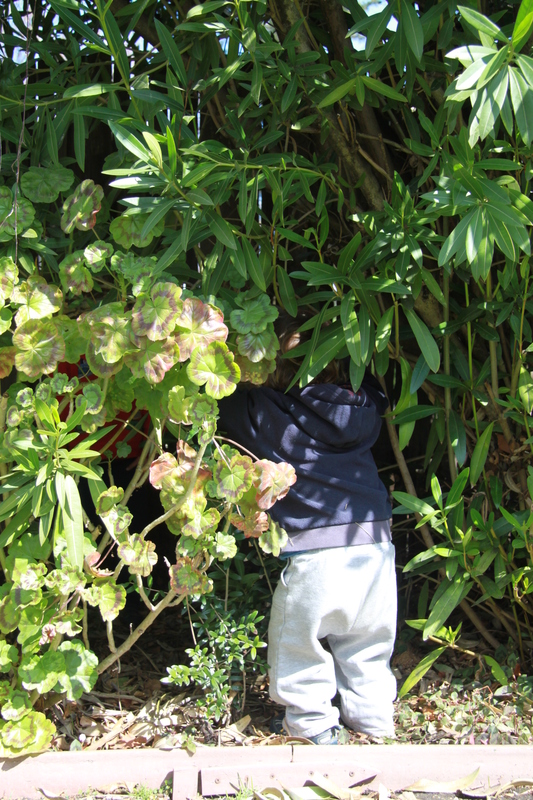 Slugs really are magical to eighteen-month old boys. 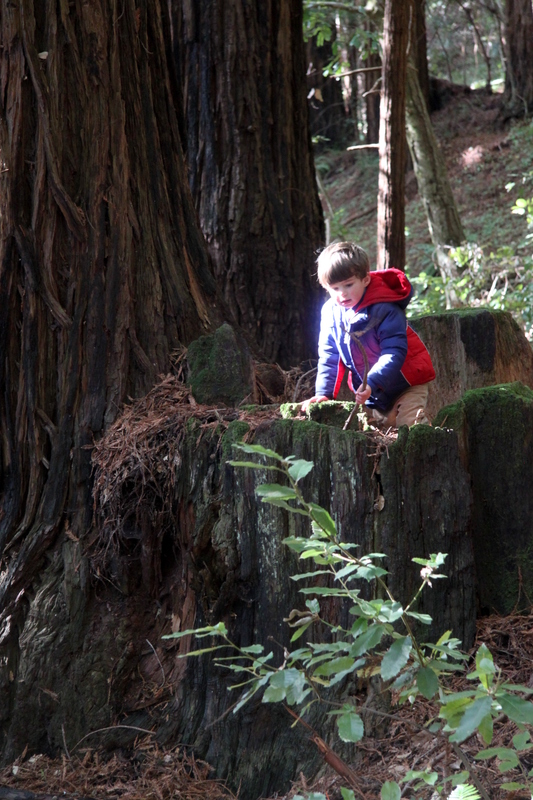 If you feel like venturing into the forest, it’s a great park. Just note the $6 day use fee and be warned that there is a distinct lack of parking near the trailheads! We found this one in Memorial Park. The boys played here for the longest time. I’m finding many of our most successful hikes are those on which we stop and make time for unstructured play if that’s what the boys want to do.